Will the Asus Eee PC be available November 1st? 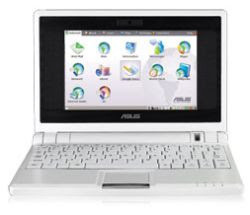 Rumor has it that the Asus Eee PC will be released on November 1st. I’m taking this with a grain of salt. First we heard that the tiny Linux-based laptop from Asus would be available in September. Then we heard mid-October. Now that it’s nearly mid-October it’s not too surprising to hear the date’s been pushed back again. The price keeps going up too. I first got excited about the Eee PC because it sported a $199 price tag. It’s not clear whether a $199 version will be available or if the cheapest model will be $259, with pricier models going for up to $399. That said, the Eee PC is still one of the two bits of hardware coming out in November that I can’t wait to get my hands on. Sony is set to release the PCM-D50 digital audio recorder next month, which will satisfy the audio geek in me. The Eee PC should take care of my mobile computing geek side. What’s so cool about the Eee PC? First up, it’s a low-cost laptop for under $300. Second, it’s tiny, weighing in at just about 2 pounds. That means you also only get a 7-inch screen on the basic model (the pricier models will have 10-inch screens). But this isn’t a desktop replacement. Rather, it’s a mobile computer that you can throw in a bag and take anywhere. You don’t get a powerhouse for your money. The Eee PC packs a 900 MHz celeron processor, from 256 to 512MB RAM, and from 2GB to 4GB of internal flash memory last we heard. The specs are subject to change. Early on we’d heard that the units would not be upgradeable, but it turns out upgrading the RAM is pretty easy. One of the first things I did when I bought my Toshiba A135-4527 laptop was to create a partition for Linux. But after having tried several varieties of Ubuntu, Mandriva, and Fedora, I’ve come to the conclusion that there’s not much Linux support for some of the hardware in this PC. And while a true Linux wiz could probably hack together a solution, I’d rather just buy a system where the hardware and software are meant to work together. The Eee PC runs a custom version of Xandros. I’m not sure if I’ll be able to do any sort of audio editing on it, but for $259, it would make a great mobile companion for the times I don’t feel like lugging around my 6 pound laptop, power supply and other gear. For example, the Eee PC would be great for blogging from a coffee shop. It’s got 802.11b/g and a 4 cell battery that should be good for about 3 hours. Now I just have to see if my budget will let me buy a $600 professional audio recorder and a $259 laptop in the same month. Might be time to hit up eBay and sell some older equipment. If it’s on Xandros then it should be possible to load linux apps like Audacity to do some audio editing. I’ll let someone else find out first. If it’s $300 then I can get as much power in a refurb on ebay and run ubuntu. Yeah, mostly I’m wondering if the processor will be up to running something like Ardour. I suppose Audacity would do if I’m looking for quick and dirty edits on the go. As for a refurb, the idea has crossed my mind, but I already have a 6 pound laptop that dual boots Ubuntu. What I’d really love is an ultraportable light weight machine that gets decent battery life.